Neha -Angad: A Wedding Was Full Of Controversies! The month of May has witnessed the most talked about wedding of Sonam Kapoor with Anand Ahuja. 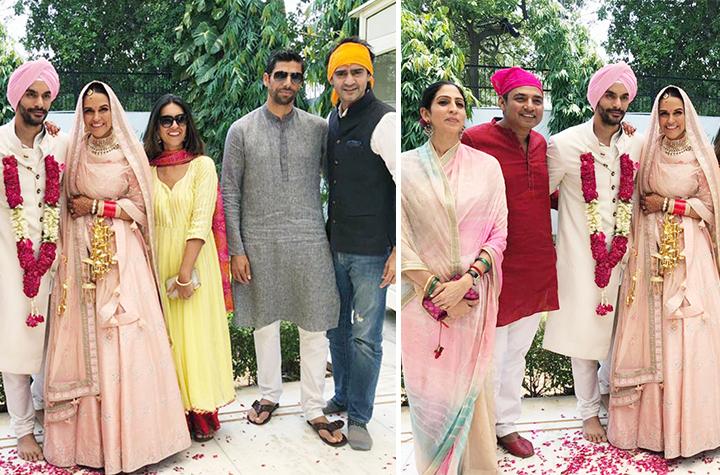 But what came as a surprise to the media and the fans was the quiet wedding of Neha Dhupia with actor Angad Bedi. Former Miss India, Neha Dhupia tied knot with boyfriend actor, Angad Bedi, son of retired cricketer, Bishan Singh Bedi on May 10 in Delhi in a traditional Sikh ceremony. Their wedding was a wave of surprise as the media failed to get a whiff of it. The couple announced their wedding on their social media accounts which was later flooded with congratulatory messages for the couple. But they have also been at the receiving end of a lot of negativity. 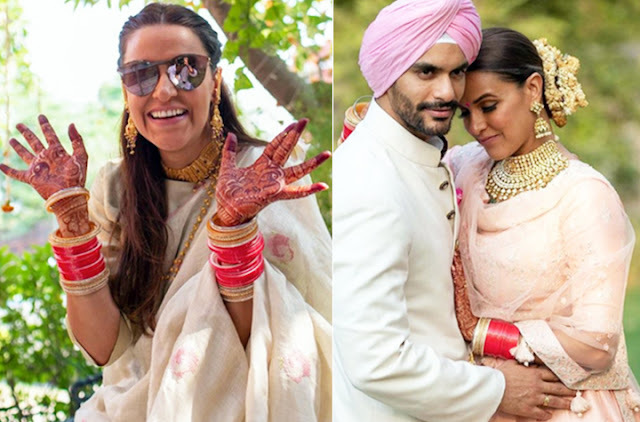 Neha Dhupia, who is 2 year older to Angad, was trolled for marrying a man younger to her. But as we all know, boss lady Neha is one who will not accept such negativity in her personal affairs by anyone. And in came the best befitting reply for such trollers from the lady herself asking them to take care of their own lives and not poke their nose in other people’s private life. Ace film director, Karan Johar, actress Sophie Choudhury and many others from the Bollywood industry had sent heartfelt congratulatory messages for the couple. 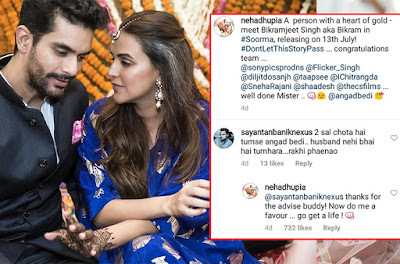 Neha Dhupia, who was last seen with ace actress Vidya Balan in Tumhari Sulu, had shared a message on her social media account stating that marrying Angad Bedi, her best friend, was the best decision of her life. Angad Bedi, known for his unforgettable roles in Pink and Tiger Zinda Hai, has equally quoted that to marry Neha Dhupia was his best decision. The couple was provided support from both the families as they approved of their relationship. But amidst all the happy moments for the families, negative comments about Neha being older to husband, Angad has had its own effects to a certain extent in its own way. People have been spreading rumours and speculating that the wedding news was kept secret because Neha was pregnant. But such rumours never got any further than this and need not be confirmed as to being true or not by anyone. 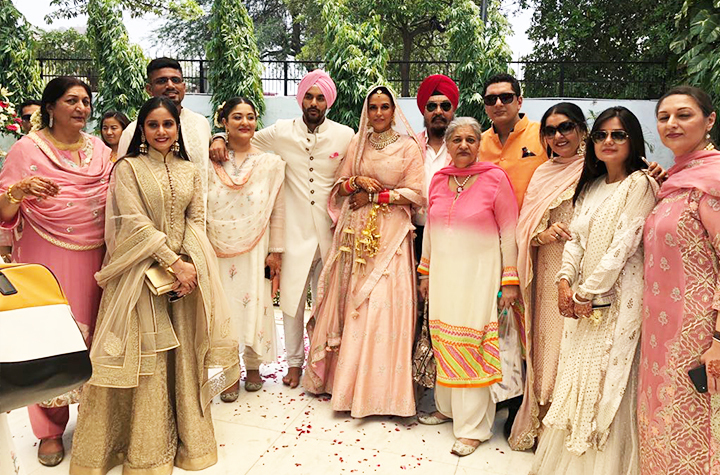 For her wedding, Neha was seen wearing a pink lehenga paired with matching jewellery whereas Angad wore white bandhgala completed with pink turban. All the fans of Neha and Angad have wished them all the very best for their new journey ahead.